Minimum let period one week. 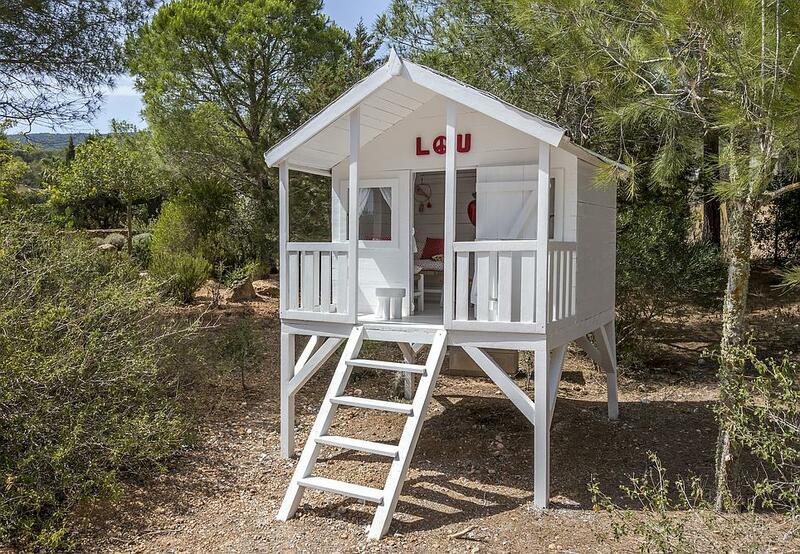 This section of Ibiza’s south coast between Porroig and Es Cubells is known as the golden mile, both for its beautiful coastline and for the exclusivity of its properties. 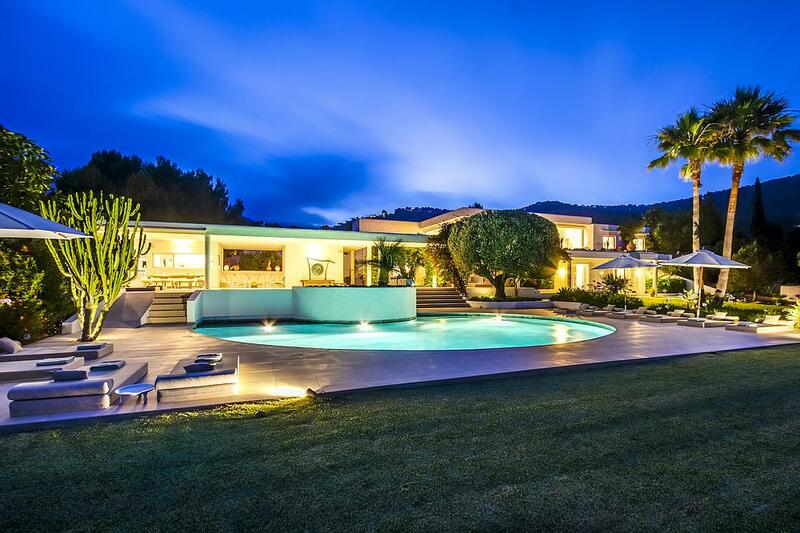 Can Felipe doesn’t disappoint on either count; with stunning sea and mountain views, this modern Ibizan holiday home is a spacious and luxurious Ibizan retreat. 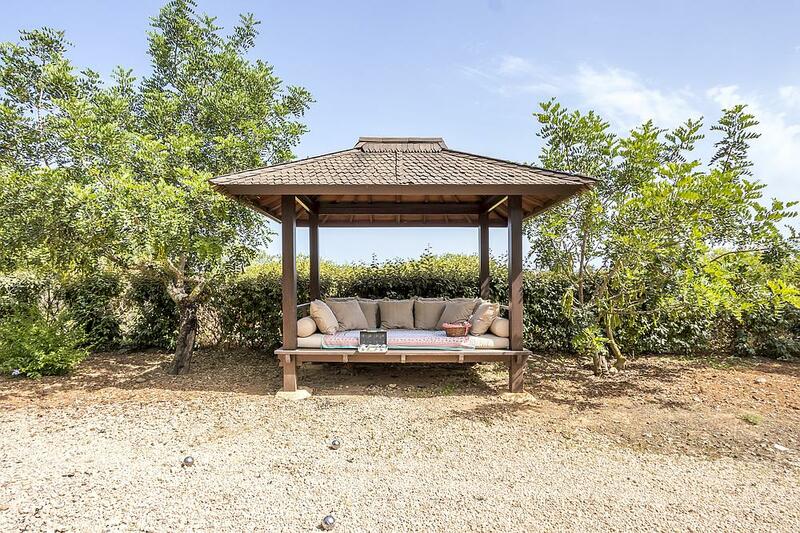 Sitting within 10,000m2 of beautifully landscaped gardens bursting with fruit trees, including apricots, peaches, figs and almonds, you are treated to beautiful views across farmland to the neighbouring pine-clad hillsides. 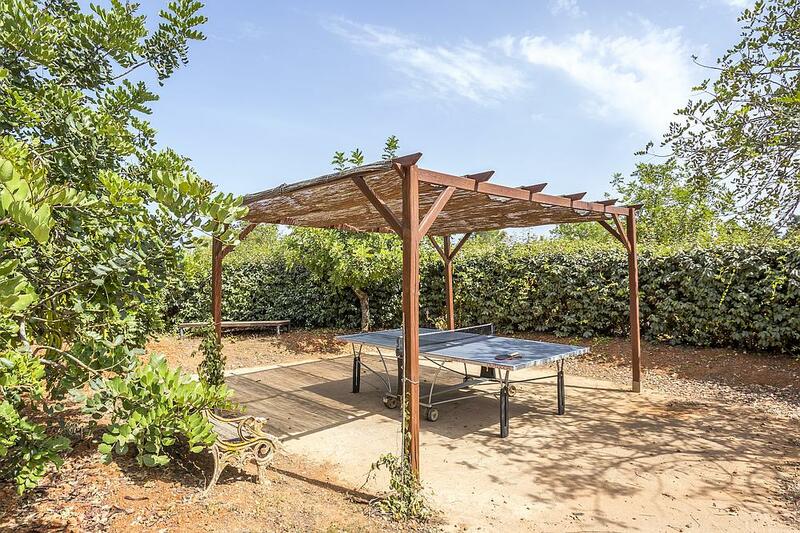 The gardens are also home to an oversized checkers set, table tennis table, petanque court and trampoline. 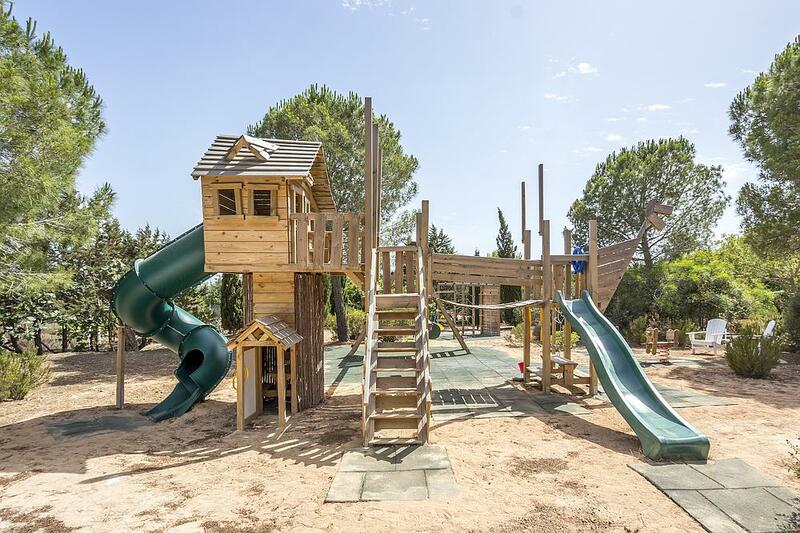 Your children will love the large play area with climbing frame, swings and two wooden play houses. 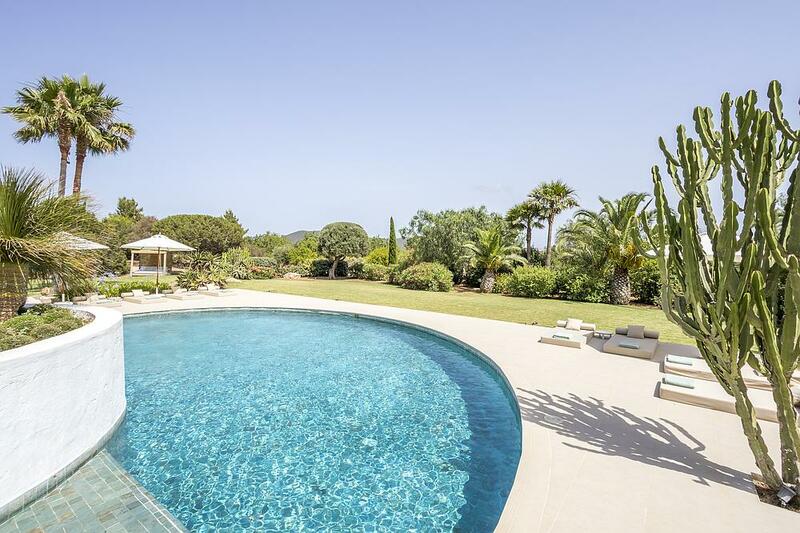 Across the sunny lawn, dotted with tall pines and lazy daybeds, you reach the fabulous pool. 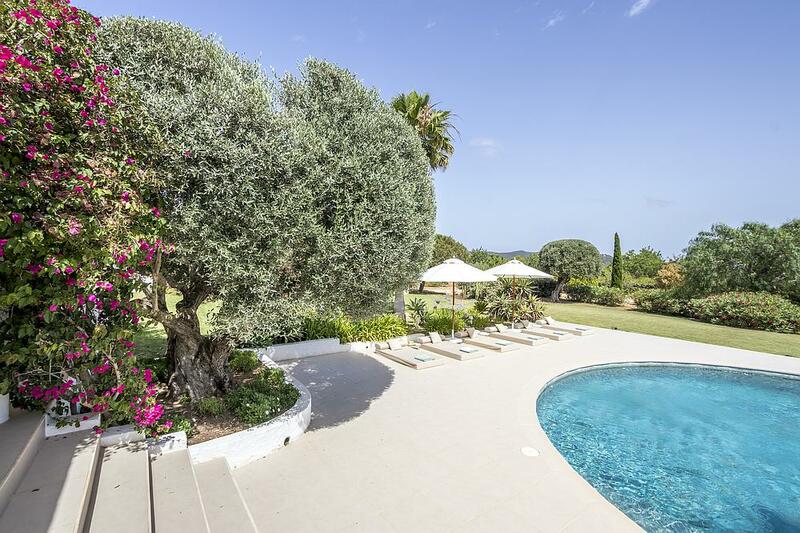 With a 10m x 6m main pool, separate jacuzzi and a solar-heated children’s pool, this is another great family-friendly feature in this wonderful Ibizan holiday home. 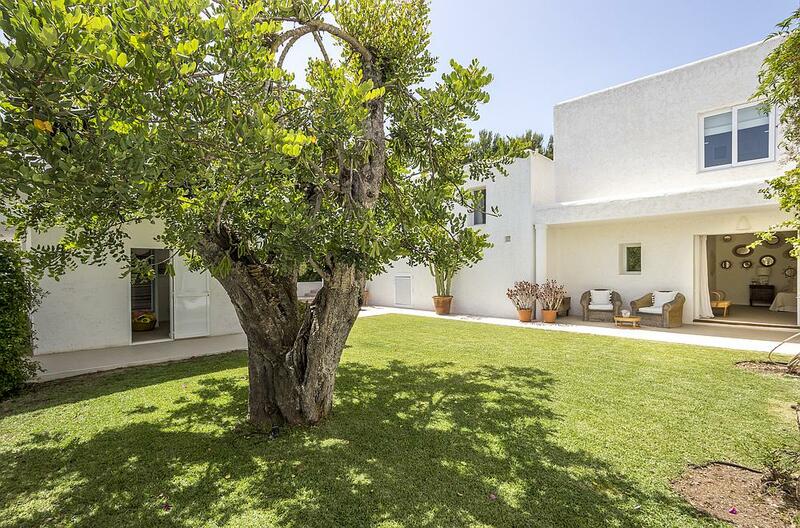 Beside the pool, a shady terrace boasts a stylish al-fresco dining table, seating twelve. Additional tables and benches are available, seating up to 40 people. 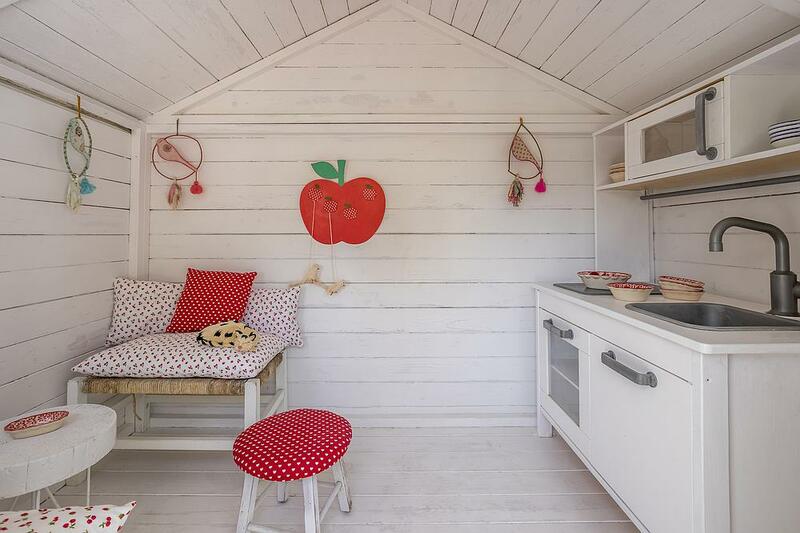 The terrace wraps around the house to reveal a pretty barbeque area and summer kitchen overlooking the flower-filled gardens. 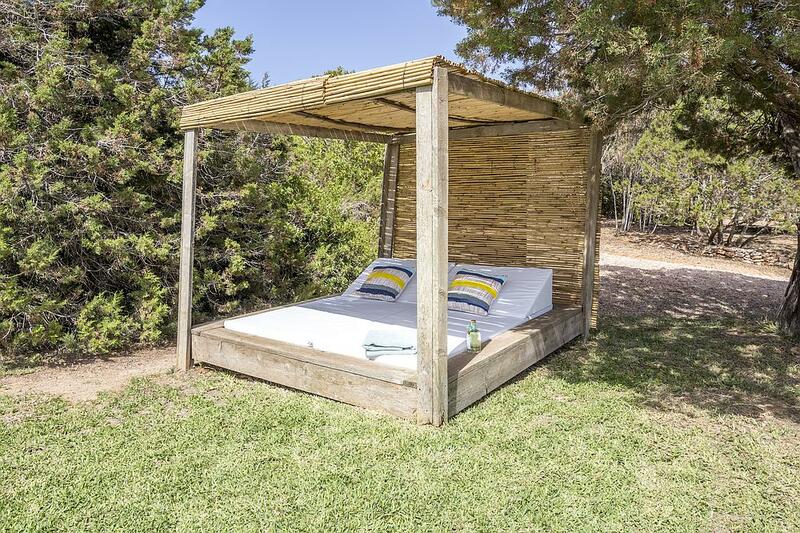 Soak up some glorious Ibizan sunshine on a poolside lounger, relax in soft lounge seating under the shade of the terrace, or head up to the roof terrace for incredible sunset views. 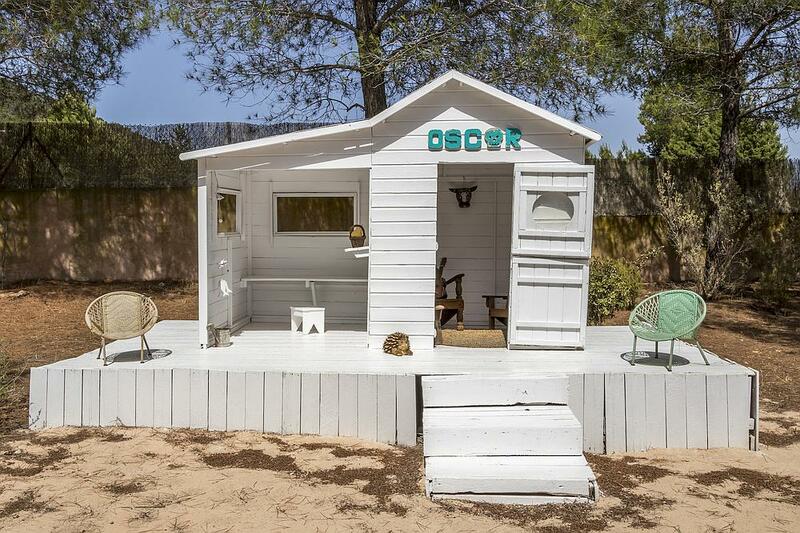 Can Felipe’s immaculate, light-filled interiors have a serene vibe of sophisticated cosiness. Pale tiles, white walls, pristine linens, accents of bright golds and eastern mysticism combine to create a light and airy family-friendly space. 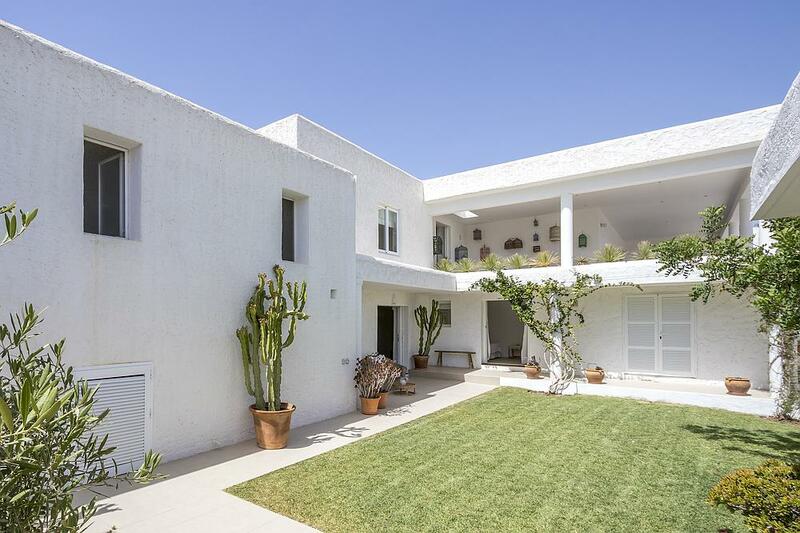 With light-filled bedrooms, pristine bathrooms, and cosy living spaces in the same fresh, white hues, including a small and well-equipped gym, Can Felipe has room for the whole family to relax and unwind. 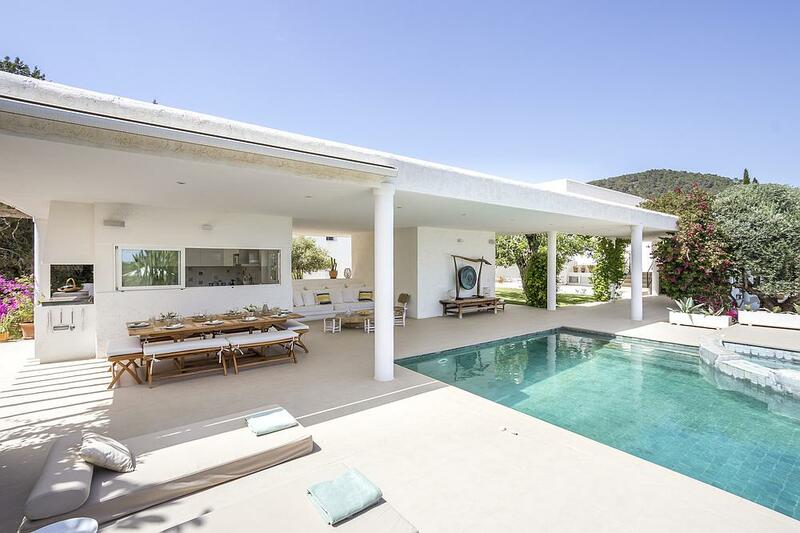 Can Felipe doesn’t disappoint on either count; with stunning sea and mountain views, this modern Ibizan holiday home is a spacious and luxurious Ibizan retreat. 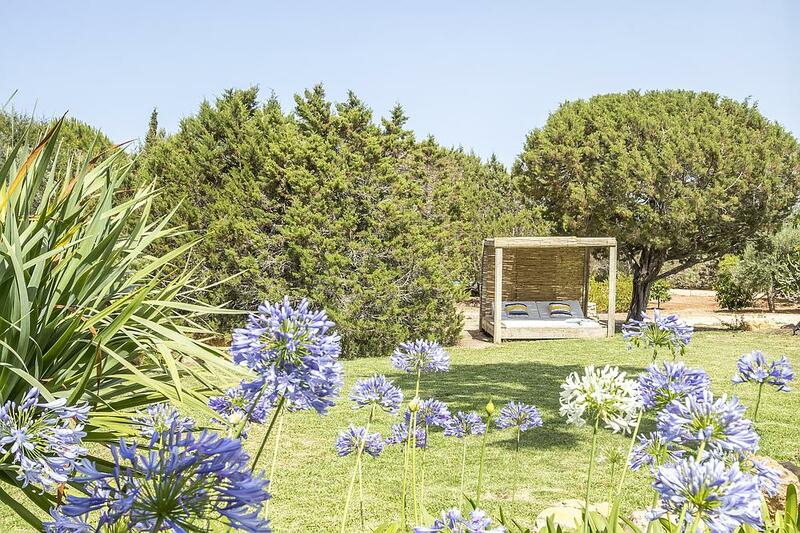 Sitting within 10,000m2 of beautifully landscaped gardens bursting with fruit trees, including apricots, peaches, figs and almonds, you are treated to beautiful views across farmland to the neighbouring pine-clad hillsides. 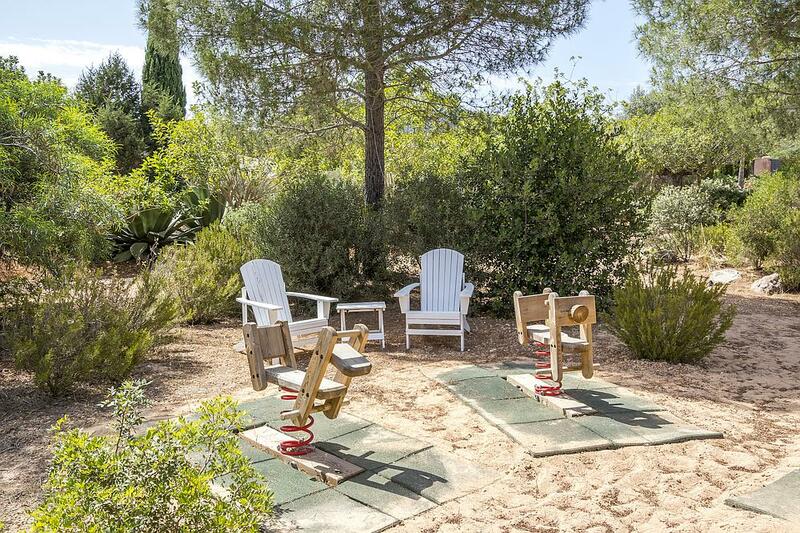 The gardens are also home to an oversized checkers set, table tennis table, petanque court and trampoline. 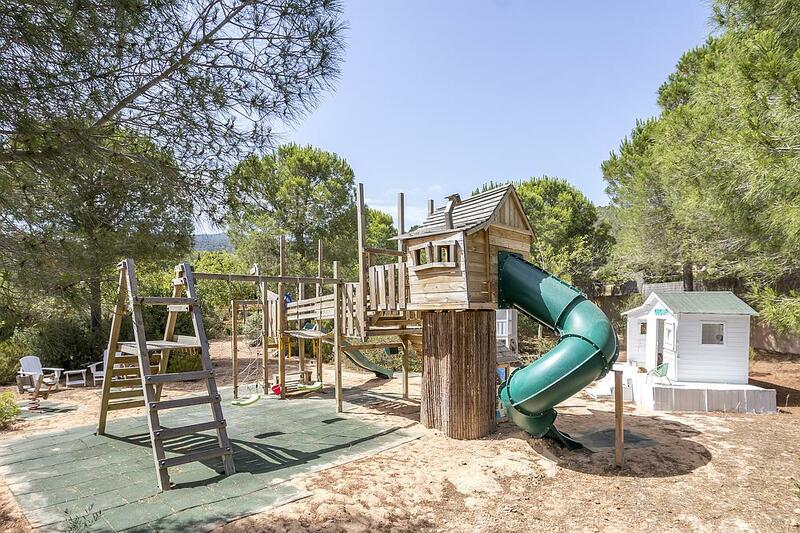 Your children will love the large play area with climbing frame, swings and two wooden play houses. 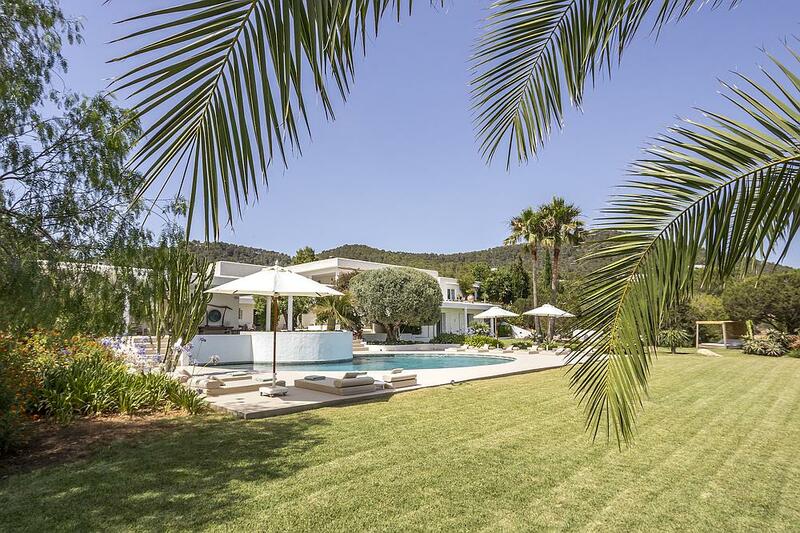 Across the sunny lawn, dotted with tall pines and lazy daybeds, you reach the fabulous pool. 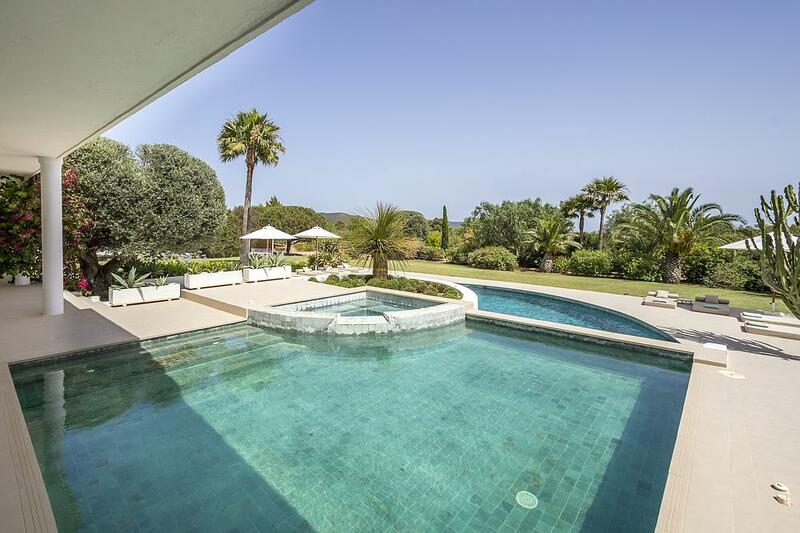 With a 10m x 6m main pool, separate jacuzzi and a solar-heated children’s pool, this is another great family-friendly feature in this wonderful Ibizan holiday home. 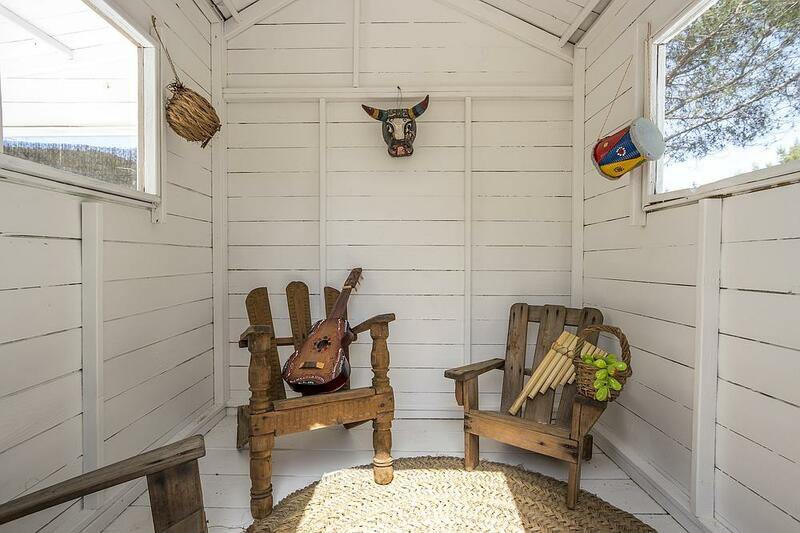 Beside the pool, a shady terrace boasts a stylish al-fresco dining table, seating twelve. Additional tables and benches are available, seating up to 40 people. The terrace wraps around the house to reveal a pretty barbeque area and summer kitchen overlooking the flower-filled gardens. 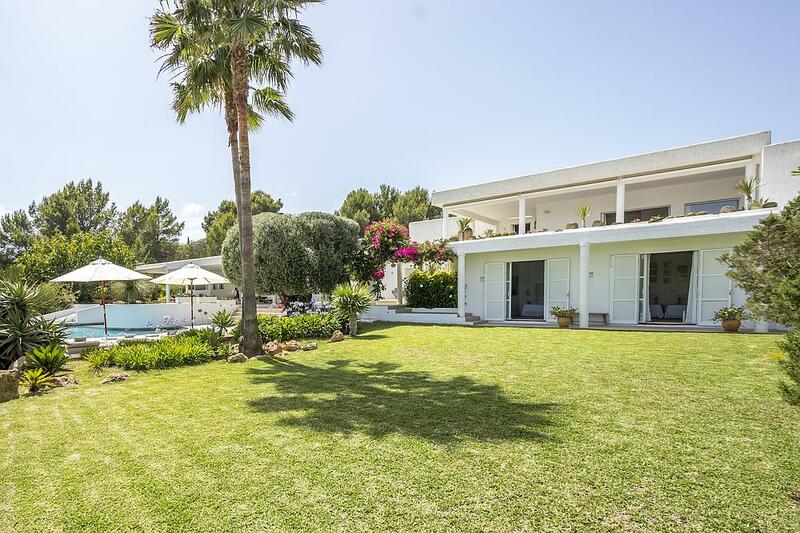 Soak up some glorious Ibizan sunshine on a poolside lounger, relax in soft lounge seating under the shade of the terrace, or head up to the roof terrace for incredible sunset views. Can Felipe’s immaculate, light-filled interiors have a serene vibe of sophisticated cosiness. Pale tiles, white walls, pristine linens, accents of bright golds and eastern mysticism combine to create a light and airy family-friendly space. 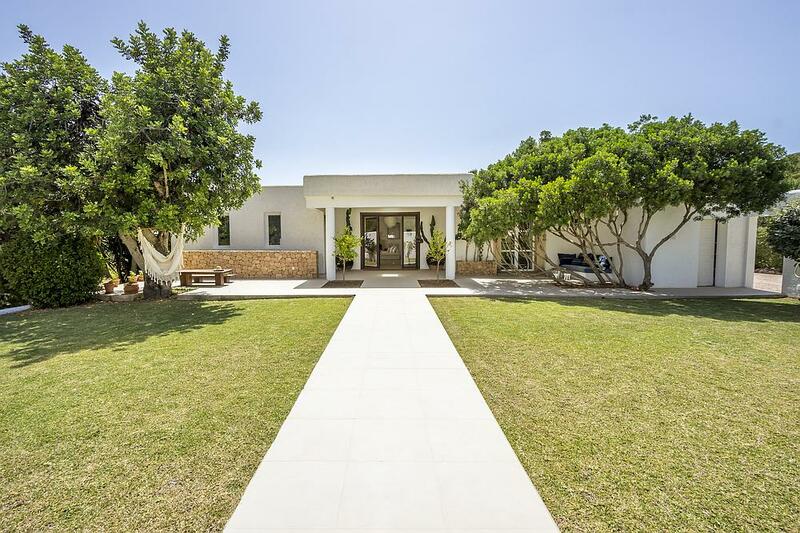 With light-filled bedrooms, pristine bathrooms, and cosy living spaces in the same fresh, white hues, including a small and well-equipped gym, Can Felipe has room for the whole family to relax and unwind. Call us at any time on +44 (0) 203 735 5818 or on +44 (0) 1494 815411 for immediate response, or fill in the form below. 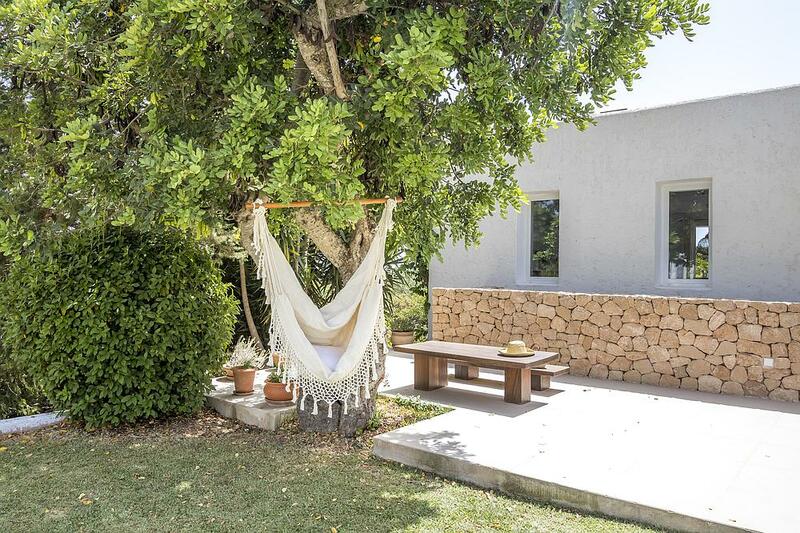 Availability of villas can't be confirmed online but we will come back to you very quickly and confirm that the house is still available, and send a detailed quote. We will not use your details for any other purpose. How many children? 0 1 2 3 4 5 6 7 8 Any other important details or requirements? Yes I would like you to send me emails about new villas and special offers.